As you all may or may not have noticed, I am hosting my first-ever Holiday Gift Guide this year! I have never done one in the past and am very excited to bring you some of the best and hottest gift ideas that are out there for this up-coming holiday season. Today, I am giving you a little sneak peek into what this Gift Guide holds for you and what better way to start than with a fabulous gift idea for children! Books are things that every child loves. Whether it is sitting down to flip through board books, or reading chapter books, children enjoy the thrill and excitement of what awaits their little minds within each book. My children LOVE to read; we visit our local library at least once a week and get out several books for them. Jacob, my two year old, really loves the books about trucks and heavy equipment. Although he cannot read, he totally understands the pictures and "reads" in his own little way. My daughter enjoys any book, but especially books about children, families and pets. She is a very inquisitive little girl and needs to be kept busy all the time...books have been our answer for her! With Christmas a little over 9 weeks away (!!!) it is not too early to start thinking about Christmas gifts for your little ones. We don't believe in Santa Claus so naturally, we don't teach our children about him. We teach them that Christmas is a time of year that is set aside to celebrate the birth of Jesus. So many people get caught up in the commercialization of Christmas that the true meaning is totally lost in all the hustle and bustle. That was the inspiration behind "The Sparkle Box". 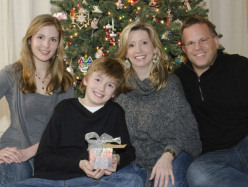 Author Jill Hardie, her husband, and their two children began the tradition of placing a Sparkle Box for Jesus under their Christmas tree approximately six years ago. The first time they opened His gift, the commercialism of the season melted away and they experienced profound peace and happiness. It's Jill's hope that The Sparkle Box book will ignite a new Christmas tradition that helps center Christmas in the true joy of the season. Because of the fact that we are Bible-believing Christians, we love books that teach our children about Jesus and how serving Him brings peace and joy. "The Sparkle Box" really excited me as it promised to be a great teaching tool for my children. So, for this review I was sent "The Sparkle Box" to read to my children and to share with you! It arrived the other day and I just had to review it now!! Oh yes, and the book comes with a sparkle box that you can unfold and make into your very own box and yes, it is glittery too! I just love all of the beautiful pictures that are found in this book. They are all very colorful and really portray the story well. The illustrations are drawn by Christine Kornacki and she did a really fantastic job. What I think I love the most about this book is that there is no mention of Santa Claus at all so I don't have to "ad-lib" any parts. Sam can’t wait for Christmas! He’s excited about the parties and the food and, of course, the gifts. One present in particular has Sam curious—a sparkling silver box on the mantel. Sam’s parents will only tell him that they will open the gift together, but that they need to fill it first. 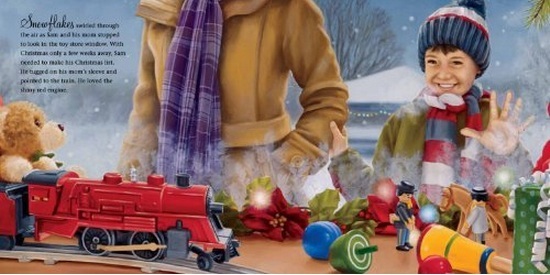 Throughout the holiday season, Sam and his family participate in various charitable acts together. Gradually, Sam starts to see how fortunate he is and how important it is to help others. This story will inspire readers to adopt this tradition and to experience the true meaning of the Christmas holiday. Being a parent, I am constantly trying to instill good values into my children and this book has given me a wonderful idea on how I can do that. I plan to use our Sparkle Box for this upcoming holiday season and I think I am going to focus on the children doing nice things for each other and then writing those things down and putting them in our box. They are having a hard time learning how to be KIND and this would help encourage them to be kind, and in turn, make Jesus' heart very happy. What a great way to teach them how to love and care! 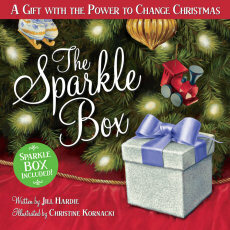 "The Sparkle Box" retails for $19.99 and can be purchased at any book store. You can also purchase it online by clicking HERE. So, in my opinion..."The Sparkle Box" is a fantastic book and would make a wonderful gift for any child this holiday season. I love the values that are instilled and taught by this book and look forward to reading this book to my children in the weeks, months and years to come! One of you can WIN your very own copy of "The Sparkle Box"! This giveaway will end in time for you to give this book to a special little person in your life. So get your entries in and scratch a name off your shopping list! Disclaimer: I received no monetary compensation for this post. I did receive a free book for review purposes. All quotes and stock photos are from the "The Sparkle Box" website and email. Prize is being provided and shipped by the sponsor. All thoughts and opinions are 100% mine. In my opinion...you did an amazing job with this review of the Sparkle Box. I know Jill personally and you have captured her heart and vision for this book. It will bring unspeakable joy and peace into every home and every recipient of these tender acts of kindness. I did it last year and it is wonderful. Jesus receives the Honor and Glory....now that's a true celebration of Christmas. Thank you for this beautiful KUDOS! My children have always asked if they could leave a present for Jesus. It would be interesting to have them right their Christmas gift idea on a piece of paper to be opened on Christmas morning. Love this idea. It would be cute to have my daughter put her wishes and prayers for others "in" the box. We could put it under the tree and I think every time we saw it we would be reminding of those prayers for others. I def agree with you... Christmas has become too commercialized and many have lost the true meaning. Our changes this year include limiting their list to 3 items, and we will be volunteering as a family throughout the season (and hopefully after the holidays, too). I would love to put ideas for my children to "pay it forward", they would love this! This sounds like a wonderful book...I think I would have my children put prayers we have been praying for people and ways they could show love to others in it. I would love for us as a family to put an act of service in the box! we are going to do operation christmas child to help teach the kids about others who are less fortunate. I have been wanted to start doing Random Acts of Kindness with my kids this holiday season. They are getting to ages where I think they would find it really fun. I think it would be wonderful to add those to our Sparkle Box. It sounds like a wonderful story. My daughter will be three soon and learning about sharing, giving, and being kind are three challenging things at this age. We have already discussed some ways we would love to bless people around us this holiday season by making meals, cleaning houses, and buying a some gifts for some families. Wow I love this idea! I will be using this one for sure!! This book seems wonderful. My son is 3 so we could put pictures of nice things to do for others in the box. EvaLou24 at yahoo dot com. I would love this! We get a new Christmas book every year, and this would be great. Would love to get this book- what great meaning behind it! We plan to do operation christmas child. I would write down all of the things the kids did to be kind or helpful to someone during the Christmas season. Sometimes a gift of kindness can go further than a store bought gift. We thank Jesus for something every night at prayer time. This would be another way to put those thank yous in a special box. My Sparkle Box idea is to have my children put our friends and neighbors names in the box that we want to do a nice thing for. Maybe just have an empty box of nice things they can do for others - ways to show love? I would write down all the wonderful characteristics of my kids and put them in the box so they know how much we love them. I would have each of my children write down what they feel the true meaning of Christmas and Christmas time is and read them aloud on Christmas day. I think anything to help the victims of Sandy. we raise money to send kids to school in africa. I love the idea of teaching the kiddos that doing things for others is giving gifts to god. i would stick with that theme. Can't think of anything better. My idea would be to try to help people in my community. I'll probably do the Angel Tree at the Salvation Army. I try to do what I can because there are children in such need of basic necessities. Sigh. kristiedonelson(at)gmail(dot)com Thank you. would love to put things we could do for others in the box. I would have the kids I sit for write down one nice/thoughtful thing they did for someone and put it in the box each day. Then we would read them together right before Christmas and hear how everyone else spread love throughout the season!